Personalize your outdoor space with some of our colorful Adirondack chairs. 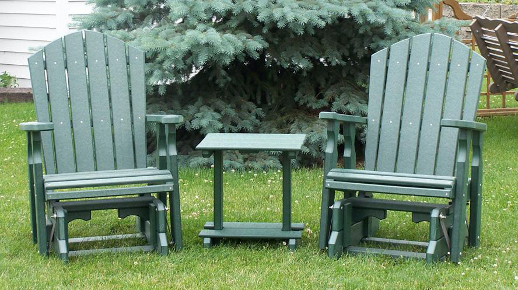 Our patio furniture is maintenance free and made mostly from recycled plastic. This furniture won’t rot, mold, rust, or blow away in most winds so there’s no need to put these chairs inside for the winter months. We have 15 different colors and multiple styles to choose from. Need a place to store your garden tools? How about a small coup to raise chickens? Maybe a playhouse for the children or grandchildren? 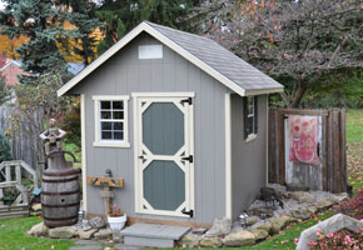 A shed for Grandpa so he is not underfoot in Grandma’s kitchen? We have multiple outdoor structures to choose from and many have the option to be ordered by phone and shipped directly to your home. 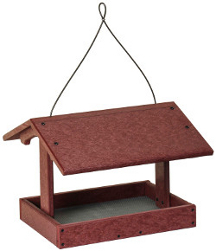 We have a wide variety of bird feeders that will appeal to our bird lovers who enjoy the activity, chirping and feeding of our fine feathered friends. Should you prefer soft musical tones we also offer many different types of outdoor wind chimes making any outdoor seating area a more pleasant relaxing location. With each change of season our store transforms both inside and out! We make use of our patio area year round. If we don’t have our colorful lawn furniture on display, you will find other seasonal products.